Having read warnings of overbookings,wrong room allocations,we decided to take a chance on them getting their act together, on booking in, the young receptionist said could we wait for some other sets of visitors to arrive, as the manager would like a word with us all. This proved to be a well thought out speil,to keep this review short,it transpired that at least six couples would not get the rooms they had booked and paid for. Instead we got rooms any place they could fit us! our room 115 being what my wife referred to as the "Dungeon Room",at this point will not go into the other finer details, but just to put you in the picture,we have both stayed all around Crete for some 29 years, and visit twice a year when possible, so you can well imagine some of the things and places, we have seen. Even the rep, whose first visit this was to the hotel, could not get us a decent up to our standard, clean room, so it was our abode for two days and nights, although we had a car for the week so only when changing or bed time caused us grief. Our arrival date was Tuesday, our room transfer was Thursday p.m. Promises of moving assistance, we are still awaiting, also the promised bottle of wine is still on its way. Could be a good vintage when it arrives. After the move we both enjoyed the rest our our stay, with a beautiful sea view room, although the first encounter with the hotel took the shine away for a while.Something we found quite annoying is that several companies including ours had complaints on other holiday report sites, oulining the exact same problems we met, some being booked into other hotels because of the overbooking. On being tackled about this, some HQ based staff denied this ever occured. Regarding the food,breakfast is the only meal we would comment on,which was ok.the hotel location was backing on to the beach,which was not cleaned, or had not been cleaned by the hotel for some time, also be aware the beds etc are charged for. The girls that form the staff are first class,the males need some urgent lessons in manners,as on many occasions they had to be spoken to by a guest, including myself. We would not visit this hotel again because of the problems outline above, also it seems that no lessons have been learnt. 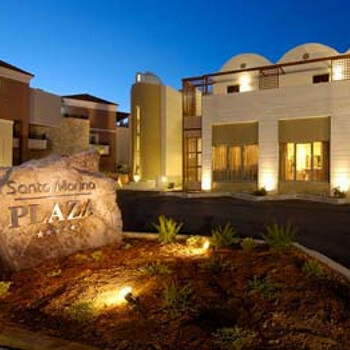 Santa Marina Beach is a four star hotel divided into two buildings divided by a road, there is an underpass combining the two buildings. The main building is a four storey on the beach front. There is also a fitness center in the cellar- which we can't comment on. Outside is also a nice terrace with comfy chairs and some tables and a buffet, however there was no food being served outside while we were there. This might have been due to the time of year- end of October. They serve breakfast and dinner, both buffet-style and with a lot of choice, however the variety at breakfast left a bit to be desired. The staff also decided to ignore you, if you turned up about ten /fifteen minutes before the end of breakfast time (the tables weren't laid again after someone had left). Apart from that everyone was very friendly and helpful. The quality of the food was excellent- a few more Greek dishes would be nice. Everything was very clean and the rooms were also cleaned and the linen changed daily. The entertainment consisted of a Greek night on Friday- just the right amount of entertainment. The bar is well equipped, the staff were charming and helpful with information about nightlife in near-by Chania. The bar prices are a bit high- by Greek standards. The hotel held a good mixture of nationalities when we were there - many Scandinavians, some Germans and some Brits.